19157 Vacancies in the Tamilnadu Police Department should be filled after TN Elections 2016 - Honourable Madras High Court Ordered. Home Police TNUSRB 19157 Vacancies in the Tamilnadu Police Department should be filled after TN Elections 2016 - Honourable Madras High Court Ordered. Mr.Thangavelu from Trichy has filed a case claiming that there are about 19157 vacancies in the TN Police Department according to a RTI reply from the Government. He also requested there should be separate police stations in the courts. 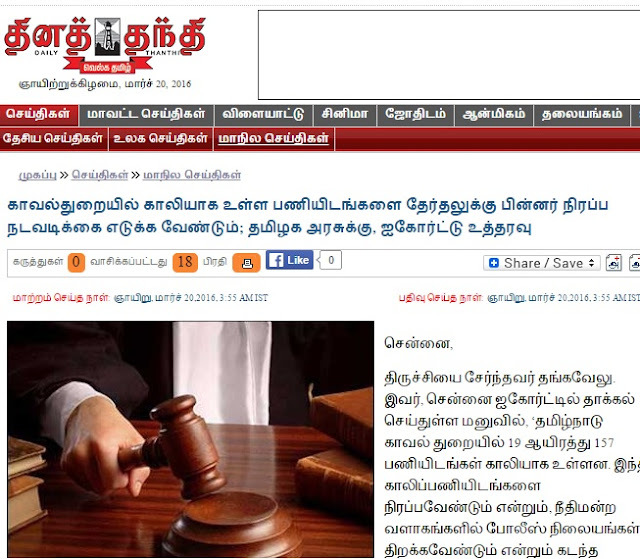 The case came for hearing in the first bench of Madras High Court under the Hon'ble Chief Justice of Madras High Court. The Court ordered the Government to consider to fill up the Police Department Vacancies on or before 15th June 2016.